Size: 3 ½" high x 3 ½"
Airplane Gift - This Vintage Airplane Coaster Set is a fun and useful pilot gift. These Airplane Coasters are fashioned after the cockpit instruments found in early day aircraft. 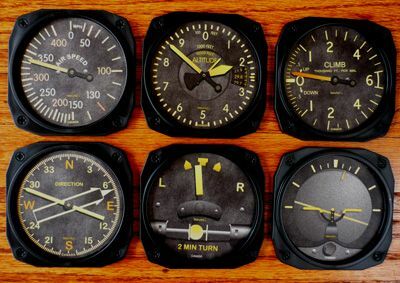 The set of 6 include the Turn & Bank Indicator, Compass, Artificial Horizon, Altitude Indicator, Rate of Climb, and Air Speed Indicator. They are made from durable polystyrene and have skid-resistant rubber backing. Excellent service - easy to complete order. Would order from you again! I have two pilots in my family and both absolutely loved the coasters. Such a great product! These were purchased as a gift for an office coworker who is learning to fly... He liked them/the idea of them, but agreed with me that they are somewhat cheap looking....appears to be stickers merely stuck to a round coaster.... Not sure what I expected, but I was disappointed in the quality. I sent these as a gift to my son in ND who is a recent commercial aviation grad and a flight instructor. Had them delivered directly to him so I haven't actually seen them, but he say's they're great!! Thanks so much. I bought these coasters for my nephew who just earned his pilot's license. He was thrilled with them! Well constructed and there's a lip around the edge that will keep condensation moisture contained. Very pleased with both the product and the service from Tailwinds.